Two “quack-acting” staff at Blackburn Council flocked to help save two ducklings that had fallen down a sewer pipe. The lucky ducklings lived to quack another day after kind-hearted Derek Wilkinson, climbed into a manhole in Blackburn’s Queens Park to save the two stranded ducklings. Derek, a member of the Council’s jetting crew, received a concerned call from a local resident on Monday afternoon. 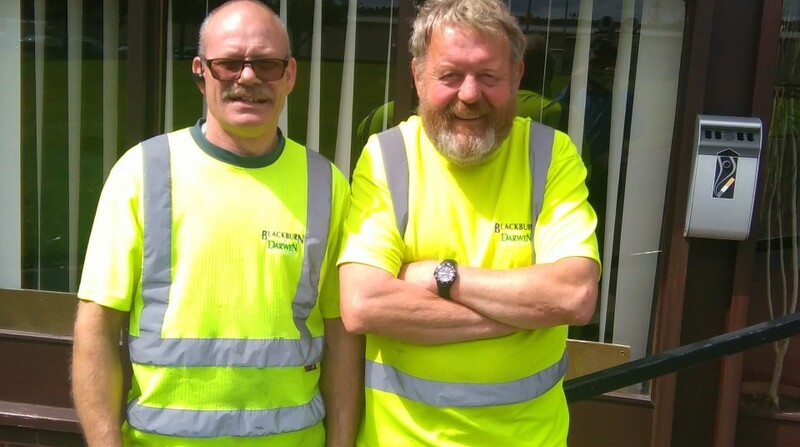 Derek, who has worked for the Council for 35 years, and his colleague Raymond Almond, helped save the ducklings. An RSPCA inspector who was already on scene was able to reach the first duckling by removing the grid cover and reaching inside but the second duckling had gotten itself stuck after falling further into the drainage pipe. Father of three, Derek Wilkinson, climbed down the manhole and carefully jetted water to dislodge the duckling, whilst colleague Ray was at the end of the drain with a net, which safely caught the duckling. The RSPCA have now taken the ducklings to safety, thankfully none the worse for their ordeal after attempting to find their mother.